When working at your Mac all day, the desktop can easily become crowded with open windows, browser pages, and other applications. If you want a better way to manage and control what’s on your Mac desktop, Optimal Layout ($14.00, free trial) is a powerful window management solution. 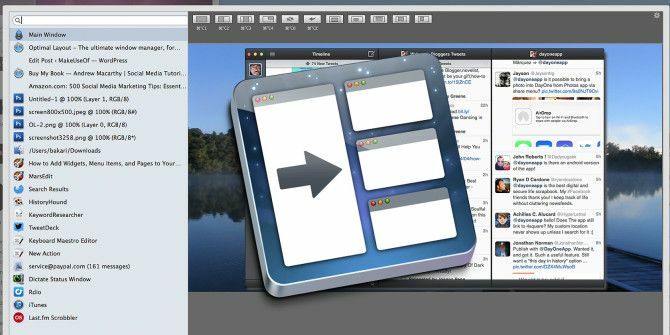 The app is similar to other window management applications for the Mac, like Moom (reviewed here Manage Your Mac Windows Efficiently With Moom Manage Your Mac Windows Efficiently With Moom One of the clumsiest things to do on Mac OS X is Windows management. I don't usually look back on my Windows years with longing, but window management has been integrated far less sloppier on... Read More ) and BetterSnapTool (reviewed here Take Control of Windows On Your Mac Desktop With BetterSnapTool and Houdini Take Control of Windows On Your Mac Desktop With BetterSnapTool and Houdini No matter if you have a small 11" MacBook Air or a 27" iMac, you typically are going to wrestle with managing windows on your desktop screen. Even though I use two monitors, I used... Read More ), but it does offer a few unique features and nuances that make it stand out from the crowd. Activated by an assigned hotkey, Optimal Layout presents a workspace consisting of active and hidden windows currently open on your Mac. You can use your mouse, or an assigned hotkey, to quickly activate, resize, and position a selected window on your main or secondary monitor. Optimal Layout is especially useful for large screen iMacs where you may want to quickly position one or more windows without the hassle of resizing them using the traditional method of grabbing the lower right corner of a window. You can either draw a selected window into the position you want, or use a predefined or custom position that fits your normal workflow. Optimal Layout provides options for repositioning windows using just the keyboard or primarily your mouse or trackpad. For even increased speed, you could map individual and regularly used keyboard shortcuts to macros in Keyboard Maestro (reviewed here Automate Everything On Your Mac with Keyboard Maestro [Mac] Automate Everything On Your Mac with Keyboard Maestro [Mac] I've written several articles about Mac automation, including a MUO Automation Guide on how to get started with Apple's Automator and the built-in OS X features for creating smart folders, playlists, albums, and mailboxes. But... Read More ), which then can be used to activate and reposition windows using an assigned string of letters, instead of having to remember complicated keyboard shortcuts. I especially like how the Optimal Layout window can see all open tabs in browser windows. You can either select a tab with the mouse, or start typing the first few letters of the title of the window to select it, and then hit the Return key to activate where you want it on the screen. Users of application launcher, Alfred will be familiar with this type of keyboard control. However, I did notice that in order to better search and filter multiple windows within same application, you need to first type the name of the application and then start typing the name of the title of the window. Optimal Layout provides a considerably faster way to switch windows than using the default options provided in the Mac operating system. After you have used Optimal Layout for a while, you will want to create window layout presets, similar to how its done in BetterSnapTool. This is done by drawing the layout you want, right-clicking on the title of the window, and selecting Save New Position. An icon indicating the new position will be placed at the top of Optimal Layout so it can be quickly selected with your mouse or with an assigned shortcut. And naturally, predefined positions can be edited removed, and even shown in the menubar of your Mac. When you right-click on a window title, you get the option to move a window to your next display (if you have one), close or quit the window, or ignore the window altogether. Optimal Layout includes a smorgasbord of settings, including the style and color of the layout window; which features you want to appear in the window, and how you want Optimal Layout to handle the activation of windows. Depending on what type of control you want, you may need to spend some time testing out the different preferences that fit your workflow. At this point you may be wondering which windows management application is best. I would be hard pressed to recommend one over the other. They each have similar functions, so you may want to try each of them to see which feels most comfortable for you. In general sense, I would probably recommend BetterSnapTool for heavy mouse users Take Control of Windows On Your Mac Desktop With BetterSnapTool and Houdini Take Control of Windows On Your Mac Desktop With BetterSnapTool and Houdini No matter if you have a small 11" MacBook Air or a 27" iMac, you typically are going to wrestle with managing windows on your desktop screen. Even though I use two monitors, I used... Read More , and Optimal Layout for those who like to use keyboard shortcuts to control and navigate windows on their Mac. Don’t forget about Moom, which Simon has covered in detail in the past Manage Your Mac Windows Efficiently With Moom Manage Your Mac Windows Efficiently With Moom One of the clumsiest things to do on Mac OS X is Windows management. I don't usually look back on my Windows years with longing, but window management has been integrated far less sloppier on... Read More . If all you want to do is snap windows side-to-side, à la Windows, then iSnap adds this functionality to OS X.
Optimal Layout is definitely worth a free trial download to test out for a week or so. Let us know what you think of the application and how you’re using it, or whether you prefer one of the alternatives instead. Which Mac Makes the Best Server?Switching From Windows To Mac? Ensure You Can Still Access Your Data! Mac W, you noticed that too. I use Optimal more on my iMac than on my MBA. Thanks for your feedback.